Here is my latest article, published on Medium, about how to use Electron as a GUI front end to Python 3. Check out Python to RPN if you have an old vintage HP Calculator that you want to program in Python! Impossible? See also my blog post How I used the Python AST capabilities to build a Python to Rpn converter. HexMVC - A new, lightweight, architectural pattern for building applications based on the Hexagonal layered architecture pattern + MVC – presented by Andy Bulka. To be published 2019. Hi, my name is Andy Bulka and I am a Python and Nodejs/Electron software developer. I love design patterns and UML. UML (Unified Modelling Language) has fallen out of favour in the last decade and now tends to only get used in the most basic of ways. Sketches on whiteboards to commuicate class relationships or code execution sequences. Or simple diagrams in documentation and designs. Nobody uses the complex notations of UML 2, because digramming cannot keep up with the myriad programming techniques and paradigms of 2018 - code is simply not reducible to visual information. And even if it was, you get too much visual clutter. UML is best kept simple to communicate specific aspects of code and architecture. That's where UML shines and still has a role to play. Design Patterns are now part of everyday programmer vernacular. They are often subsumed into languages at the level of syntax - iterators, observers etc. are built in to most languages. And into libraries and techniques. For example the ajax pattern, the asyc await pattern - there are so many 'design patterns' now that talking about the original GOF design patterns is rather archaic. There is a whole world of design patterns now. People don't tend to write them up and talk about them in an abstract way anymore - patterns are just built and used. I have written several design patterns that you can use in your projects. For example why not implement Relationship Manager in your next project and never worry about wiring pointers, backpointers and one-to many-relationships in your code again! I also write about how to use various MVC based architectural patterns in your projects. This website also holds my blog on UML and pattern based software development. These blog entries are often based on presentations that I have given to live audiences at various programmer enthusiast user groups or conferences. Capturing hard-won software design experience in the form of design patterns and architectural patterns is a noble cause that everyone can contribute to. You can contribute by writing patterns and maybe even coming to a Plop patterns conference. Basically when you see a software development technique a few times, and see that it isn't yet documented - write it up in Pattern format and give it a name! A pattern is more than just a "tip" or technique though - a pattern represents an abstract idea - that can be implemented in various ways depending on your circumstances. There are a couple of things I would like to see happen in the patterns world. First, it would be nice if there was a single, authoritative repository of patterns. Yes an attempt has been made - a catalog book and and various websites - but nothing authoratative. I'm starting a list of links here. Secondly, it would be nice to have deep design pattern support in UML within all our favourite IDE's. For example Netbeans has it all - coding, form design, UML and design pattern support - albiet not as integrated as it could be and not as polished as it could be. Update: Unfortunately Netbeans seems to have dropped UML support in recent builds? If IDE's are not your cup of tea, then how about this: source code should have comment markers indicating where the patterns are, so that a reverse engineering tool can visualise not only the UML but also where the patterns are. My own UML tool PyNSource will have such a feature - est. June 2011. Further advancements are arguably executable UML and even the possibility of building software without code. I muse a bit about this in my blog entry on software visualisation and my paper on design pattern tools. Patterns at all levels need to be core visual building blocks of IDE's, or at the very least, extractable from source code into some visual UML tool - rather than being design ghosts that float around, implicit, in our source code. See my blog page for details. If you would like me to run a design patterns course or consult on your next software design, please check out my product page. There is also an open source Python UML tool you might be interested in, plus references to products I have developed over the years esp. the worldclass argumentation visualisation software Rationale and bCisive. 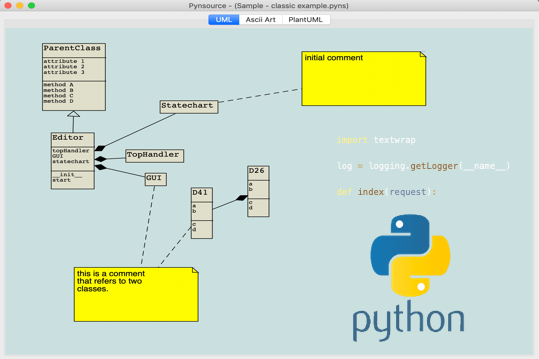 UML tool for Python - brand new version. Zoom in and out. PlantUML view. Auto Layout. Import Python 3 code. Visit the brand new dedicated website pynsource.com. Buy the Pro Edition for only $20 to unlock more features. Community Edition is fully functional and open source - check out the github repository. Donate to support this project (donate link coming soon). The video is 13 minutes long and covers the basic use cases, history of the project etc. As well as physically printing from Free42, the Print42 software can also be used to print HP Prime screenshots (from either the emulator or real HP Prime hardware via the HP connectivity kit). Outside the world of calculators, Print42 can be used to 'tail' log files (programmers take note) and to print graphic snippets from the web. Useful if you want to rapidly print information to stuff into your pocket or to study and annotate printouts of complex information, at your desk. If you are looking for a useful, fun new gadget, you might want to consider buying an Epson thermal printer and trying Print42. However you can also use Print42 with your regular desktop printer, for free. I've been publishing a lot on Medium recently. Why? Because the articles seems to get more widely read, and the Medium editor is so simple and produces beautifully formatted articles. Building a normal, deployable application for Mac or Windows, using Python 3 is hard. There is nothing like Visual Studio or Delphi (remember that?) for Python where you can drag and drop to design a GUI, press a button and get an .exe or .app to give people. Sad. The closest you can get is to follow a long recipe of steps - which I propose to outline here. Have you ever dreamt of getting your own apps in the Ubuntu app store? Here’s how.